RESQ Charitable Trust - Bedtime Tales: What Nightmares Are Made Of! Late this morning, I received four images from a friend. As I waited for the images to download, the blurry went from clear and my mind oscillated from sheer anger to fear, touching many different emotions along the way. The first picture, looked like a regular children’s storybook cover. As I scrolled further down, I noticed that the other two pictures basically contained prose and I briefly glanced at the book's title, The Unfaithful Dog. Then, to my absolute horror, I arrived at the last image: an animated dog being strangled by a noose, hung to death. I looked again, almost in disbelief because this was meant to be a children’s storybook. Then I started reading the prose. The pages told the story of a shepherd, his herd and his dog. In a nutshell, the dog had attacked and eaten the sheep he was meant to protect and for this he paid with his life at the shepherd’s hand. Obviously, there was no mention of the fact that the dog was probably hungry, a responsibility that lies with the shepherd. 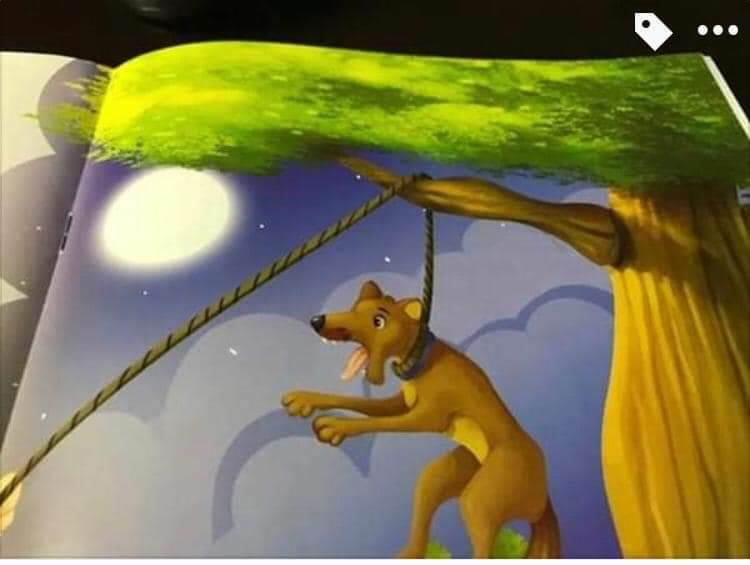 The dog was beaten until he was half dead, after which the shepherd tied a rope around his neck and hung him from the branch of a tree. Even when the dog begged for forgiveness, the shepherd accused him of being unfaithful and strangled him to death. Moral of the story: The dog got the punishment he deserved for his disloyalty. Behind the book, while covering the synopsis, the publisher has proudly stated that these stories have stellar morals and lessons that add to the values of the child reading them! I re-read everything twice. It took me some time to digest what was in front of my eyes. As someone who works with animals, dogs especially, day in and day out, I was angry. As a parent, I was mortified. My first thought? I have to protect my child from ridiculous books like this. Besides hideously crossing all lines when it comes to animal rights, the book wholly perpetuated violence. It blatantly allowed children to think that revenge is the right way to live. It made the act of killing something so casual. It undermined forgiveness completely. It made a mockery of the relationship that shepherds and their dogs share. To add to it all, it graphically represented the actions as well and humorized it too. Since when has it been okay to have anyone being strangled to death? My second thought: how many children are going to read this and think this is absolutely okay to do?! In my opinion, this book is completely unacceptable. I have been a crusader for children’s safety around animals for many years. Moreover, along with safety I have also been someone who firmly believes that children must be taught empathy from a very young age if our planet is to stand a chance to survive. Whether that is towards each other, animals, or towards nature -- empathy is key. A book like this is shameful. This book should be recalled, and the publishing house must offer a public apology for their gross inability to ascertain child-appropriate stories. In fact, this is inappropriate irrespective of who reads it, whether child or adult! The book is available as a part of a series, and costs about Rs. 60. After reading this story and having seen the illustrations that accompany it, I shudder to think what nightmarish tales form a part of this series of books. The shudder deepens when I wonder how many children have already had this story read to them, since it has been published by a well reputed publishing house that caters mainly to children’s books. In a country where culturally so many animals are respected and even worshipped, if these are the stories our children read, we are very far away from home. Tanya Kane is a certified dog trainer, behaviourist, hydrotherapist (Greyfriars, UK), and RESQ Co-Founder. Through her work at Pawsh and RESQ Charitable Trust, she has touched thousands of animal lives since 2007. A treasure trove of information on canine behaviour, Tanya is also a proud mother and fierce proponent for animal welfare.